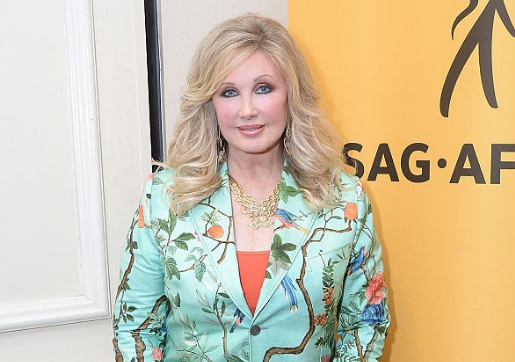 Actress Morgan Fairchild has joined the cast of NBC soap opera Days of our Lives as Anjelica Deveraux. The role was previously played by Jane Elliot (1987-1989), Shelley Taylor Morgan (1989) and Judith Chapman (1989-1991). "I was thrilled to get to work with great folks like Deidre Hall (Marlena) and Judi Evans (Adrienne) on an iconic show like Days of our Lives," she told Soap Opera Digest. "What a joy and what fun to come into work each day! We had a great time, I now have two new best friends and I hope the audience loves our storyline!" The character was last seen in Salem in 1991, but will reappear this summer with Fairchild in the role. Anjelica shares a son, Alexander, with Justin Kiriakis (Wally Kurth), and was Jack Deveraux's stepmother. Fairchild's previous daytime and primetime soap opera stints include Search for Tomorrow (as Jennifer Pace), Dallas (as Jenna Wade), Paper Dolls (as Racine), Flamingo Road (as Constance Weldon Semple Carlyle), Falcon Crest (as Jordan Roberts), The City (as Syndey Chase), Fashion House (as Sophia Blakely) and The Bold and the Beautiful (as Dorothy).